The Orbital ATK Cygnus cargo craft was pictured February 19, 2016, attached to the Canadarm2 before it was released back into Earth orbit. 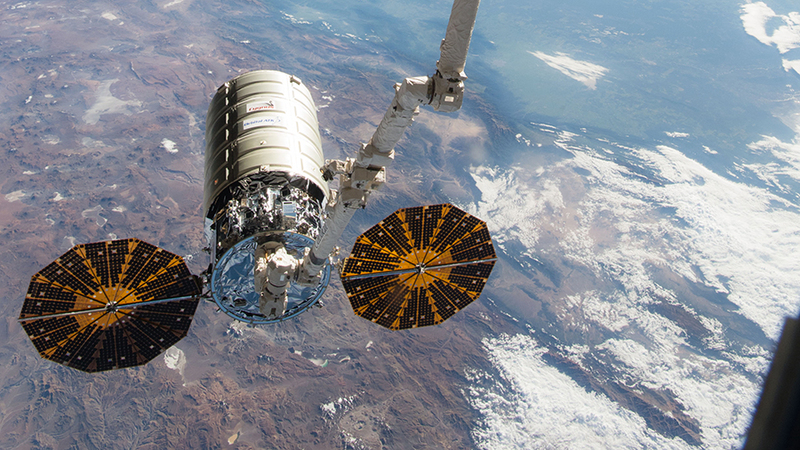 Read more about the Cygnus missions to the space station. The Orbital ATK Cygnus cargo spacecraft is set to leave the International Space Station on Wednesday, Dec. 6. NASA Television and the agency’s website will provide live coverage of Cygnus’ departure beginning at 7:45 a.m. EST. Cygnus arrived to the space station Nov. 14 with nearly 7,400 pounds of cargo to support dozens of science experiments. At approximately 8:10 a.m., Expedition 53 Flight Engineers Mark Vande Hei and Joe Acaba of NASA will give the command to release Cygnus. Earlier today, ground controllers used the Canadarm2 robotic arm to detach the Cygnus spacecraft from the Earth-facing side of the station’s Unity module. This was Orbital ATK’s eighth contracted commercial resupply mission.